"Item has missing rows in the item history table"
"Item has missing rows in the item history table". Problem: A data problem prevents QuickBooks from continuing. Solution Rebuild your data now. Close all windows and choose Utilities and then Rebuild Data from the File menu. If you see this message again, call Intuit Technical Support. ItemHistUpdateEngine.cpp (981): LVL_ERROR--Error: Item id 821 has missing rows in the item history table. Item quantity does not match quick report qty. LVL_ERROR--Error: Verify Item: Invalid inventory data. 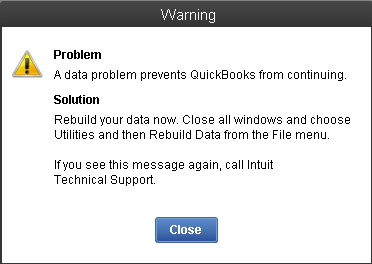 This error indicates that QuickBooks has detected data corruption. This error is related to negative inventory in the Quickbooks data file. If you are using inventory or Advanced inventory, you should not sell an item such that the quantity on hand becomes negative. Negative Inventory may be caused by entering sales-related transactions before entering the corresponding purchase-related transactions, i.e., you sell inventory items that you do not have in stock. A common solution to fix this error is to adjust transaction dates such that bills are dated before invoices. "Guaranteed Recovery, or no charge!" If you are unable to resolve the error using the basic troubleshooting steps mentioned above, your data file is most likely to be corrupted and will need to be repaired using a Quickbooks Data Recovery Service. We work with all versions of Quickbooks from DOS version 1.0 to Quickbooks Enterprise/Premier/Pro/Pro Plus 2016. We also work with all international versions of Quickbooks: Quickbooks US, Quickbooks Canada, Quickbooks UK, Quickbooks Australia and NZ (ReckonAccounts).